Warkworth Castle, near the Northumberland coast, was home to one of the most powerful noble families in the North of England. Once a scene of intrigue, plots and rebellions, the castle today is a romantic ruin in the center of a medieval village, It's fascinating to visit and a very good family day out. The origins of the castle are lost to history but it's thought that an Anglo Saxon castle occupied this prominent spot, about a mile from the sea, before the Norman Conquest in 1066. Some of what you can see when you visit, including parts of the east curtain wall and the gatehouse, were built in the late 12th and early 13th century by a Norman noble Robert fitz Roger. In the early 14th century, King Edward III gave Warkworth to the powerful Percy family and authorized funds so they could fortify their private castle because of its importance in the continual skirmishes and struggles with the Scottish clans just across the border. The castle was first fortified in 1323 and by 1327 it had been besieged by the Scots. The Percy family arrived with the nobles who followed William the Conqueror to England. After the Harrying of the North, when William drove the Anglo-Saxons and Danes out of England (by laying waste to most of Yorkshire and Northumberland), the family was given estates in the north. Within about 100 years, they were the biggest landowners in the Northeast. Round one: The first Earl was involved in the plot to remove King Richard II and replace him with Henry IV. But the family soon fell out with the King. The Earl's son, Harry Hotspur was killed in the battle of Shrewsbury and the Earl conspired (unsuccessfully) against the King Henry IV. As a result, the Percys lose their castle and lands to the Crown. Round two: Peace breaks out between the Crown and the Percys and Henry V restores their lands and castle. Round three: The Percys took the Lancastrian side in the Wars of the Roses. 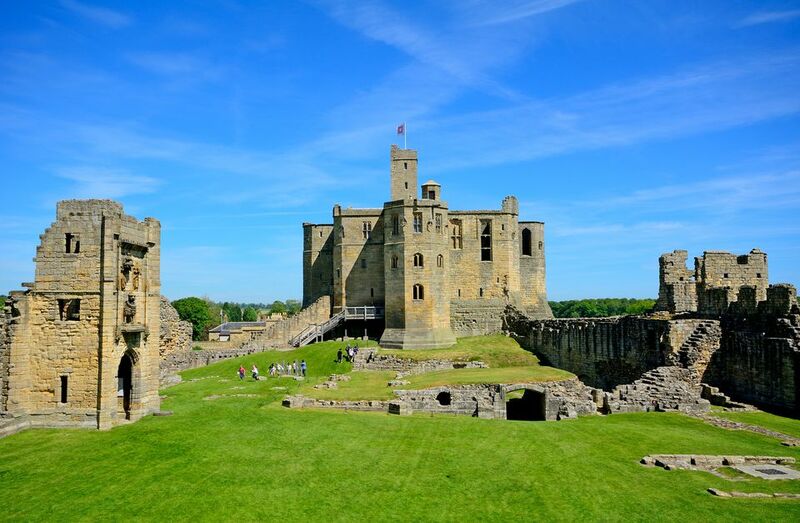 Two of the earls were killed in battles and the Yorkist forces occupied Warkworth, using it as their headquarters to lay siege to castles all round — including Alnwick, also a Percy castle. Round four: In 1470, King Edward IV restored the castle to the family. The 4th Earl had all sorts of plans for the place. But in 1489, before he could accomplish them, residents of York, protesting a tax increase ordered to pay for the military adventures of King Henry VII, pulled him from his horse and murdered him. Round five: A few decades passed during which the Percys stayed out of trouble. Then in 1569, during the reign of Queen Elizabeth I, the 7th Earl took part in the failed Rising of the North to reestablish the Roman Catholic Church in England. He was executed and the castle was pillaged. Round six: A forgiving Queen Elizabeth gave the family back their castle, but they just could not stay out of trouble for long. In 1609, the 9th Earl was involved in the Gunpowder Plot and imprisoned. The castle was leased out and neglected. As a final insult it was further damaged when it was garrisoned during the English Civil War. What is probably most amazing about this litany of rebellion is that somehow the Percys always retained their castle and lands — plus a lot more — and by the 18th century had been raised to the rank of Dukes, the highest noble rank beneath the sovereign. Today the Percy family is still going strong. The current Duke of Northumberland, a Percy, divides his time between Alnwick Castle, just a few miles from Warkworth, and Syon House in London. Warkworth, which had once been their favorite residence, was largely in ruins by the mid-19th century when some limited restoration was attempted. Two upper rooms in the unusual cruciform castle keep, known as The Duke's Rooms, were fixed up and used by the Duke and Duchess of Northumberland for summer picnics. In 1915, the castle became a listed ancient monument and in 1922, because of its historic importance, it was turned over to state guardianship. The Percys retained control of the Duke's Rooms until 1987. Today the castle is maintained and managed by English Heritage. The village of Warkworth and the castle occupy a spit of land in a loop of the River Coquet. Together they are both surrounded by water so that the river seems almost to be a moat. The Medieval village climbs up Castle Street to the castle and within the bustle of an active village, with traffic whizzing past the castle walls, it's easy to lose sight of the majesty of this place. The Great Tower: Warkworth's impressive keep was built by the first Earl of Northumberland in the 14th century to celebrate his new title. It's designed in the shape of a Greek cross and rooms and passages across its three floors can be explored. The Duke's Rooms: Two rooms in the Great Tower were roofed and floored in the 19th century for use by the Duke and his family. The walls were lined with gold patterned leather and special furniture was designed. There's limited access to the Duke's Rooms in 2019 but you can take a peek inside to see how the other half lived in the Victorian era — or at least how they picnicked. The Bailey: A variety of historic towers as well as the ruins of a church are contained within the bailey. This, by the way, is a grassy and relatively flat area with room for well-supervised children to let off a little steam. While you are exploring, look for stylized stone lions decorating some of the towers, including the one actually called The Lion Tower. The heraldic lion was the symbol of the Percy family and they stamped their identity all over the castle. Spotting the lions is an ideal activity to keep fractious children engaged. The Hermitage: The Hermitage is a remarkable chapel carved out of the rock of a riverside cliff, about a half mile up river from the castle. It was probably built by the first Earl, around 1400. The interior was carved to resemble the architecture of the period, with a vaulted ceiling and columns, all carved from living rock. The only way to reach the chapel is by water. Visitors walk up river and then take a short trip in a rowed ferry. The Hermitage has limited opening hours that are different from the Castle hours so check the prices and opening times web page before purchasing a joint ticket for both attractions. A visit to the castle, with its open areas for play and its mysterious passages and chambers, is an ideal day out for families with young children. Activity packs designed specially for them help younger family members understand the castle. There are activity sheets to pick up at the entrance and, in some of the rooms, "discovery sacks" have objects that would have been used in the daily life of the castle. Children love trying the special the "smelly cubes" in the beer cellar, latrines and church. Snacks and drinks are available on site from vending machines or you can bring in food from the village and picnic anywhere within the grounds. Accessible toilets with baby changing facilities make a family day out that much easier. And you can even bring your dog — as long as it's on a leash. The castle is less than a mile from Warkworth Beach, about 7.5 miles south of Alnwick on the A1068. The nearest train station is Alnmouth, 3.5 miles away. Check National Rail Enquiries for times and prices. Arriva runs regular bus services from Newcastle on the Newcastle to Alnwick route. The seaside town of Berwick-upon-Tweed. Alnwick Castle, the current country home of the Percy family and an iconic Harry Potter location. You can have a broomstick flying lesson there in the very spot that the boy wizard took his first flying lessons.